This week, I’m looking at the role of electricity in the ongoing global energy transition. Dieter Helm argued (see the February 13, 2018 blog about his book, Burn Out) that our increased usage of electricity is an indicator of our decreasing reliance on oil companies as the main stewards of our energy needs. It seems to me that Prof. Helm came to his conclusions mainly by observing trends within developed countries, emphasizing those countries’ growing focus on electric cars. His book, among other popular media, portrays electric cars as a triumph in decreasing our dependence on fossil fuels. Unfortunately, few of these sources say much about how we generate the electricity to power these cars. All the data in this blog come from the World Bank database. 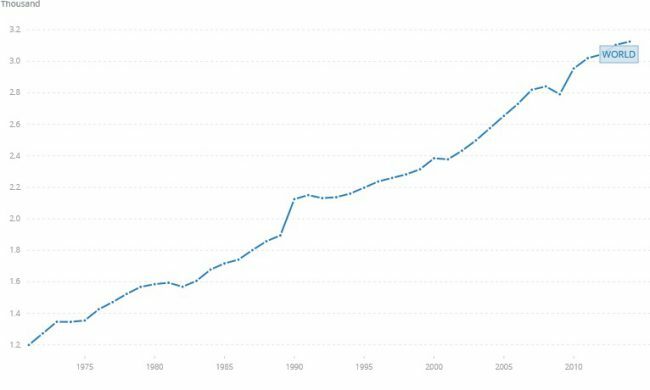 Figure 1 demonstrates a steady increase in the global use of electricity that far outpaces the population growth, GDP increase, or increase in global primary energy use that I described in last week’s blog. Figure 2 shows the role that renewable energy has played in the global electricity output. 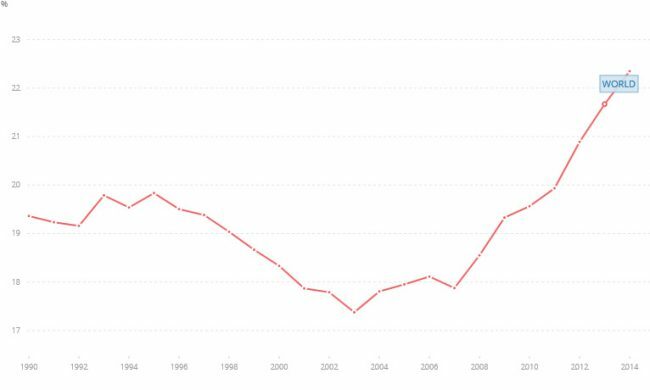 It clearly reaches its lowest point around 2003, after which it grows steadily. Tables 1 and 2 reference those shown in previous blogs and show us global trends, as represented by the twelve most populous countries (whose combined populations account for more than half the global total and the full spectrum of economic development). The tables show 100% access to electricity for the high-income countries (the five in Table 2 and the US in Table 1), upper-middle income countries (China, Brazil, Russia, and Mexico in Table 1), and two of the lower-middle income countries (Indonesia and Pakistan). 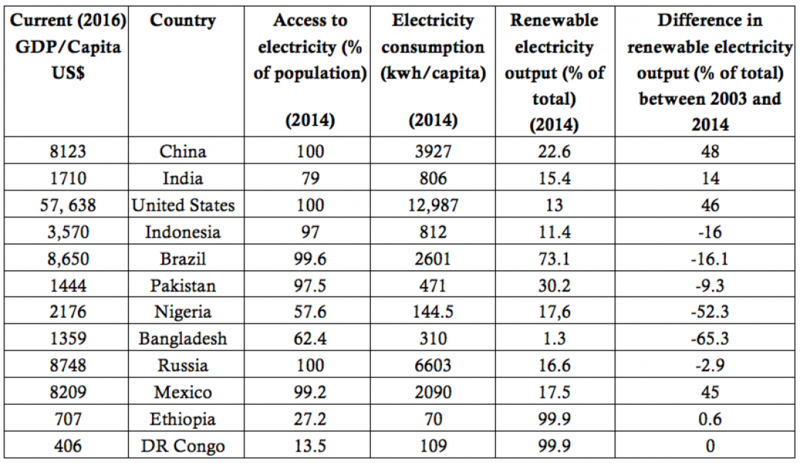 However, just counting within the countries in Table 1 (India, Nigeria, Bangladesh, Ethiopia, and Democratic Republic of Congo) more than 500 million people don’t have access to electricity. Globally, the number exceeds 1 billion. There is no question that for these countries, providing universal access to electricity and everything else that such access affords is the top priority – ahead of any environmental consideration. Focusing now on the consumption of electricity in countries that have universal access and correlating it with the wealth of these countries, one can observe interesting trends. Let’s look at the high- and upper-middle income countries from both tables. The full ranges and means of the GDPs/Capita (2016) and electricity consumptions (2014) of both groups can be summarized as follows. Both reference years are the latest available on the World Bank database. The electricity consumption per GDP for the high-income countries is 0.25 kwh/US$ and that for the upper-middle income is 0.45 kwh/US$. As in many other circumstances, the US$ is less expensive in lower income countries compared to the rich ones (economists call the exchange rate Purchasing Power Parity). Hydroelectric power plays a critical role in the variability of individual countries’ abilities to generate electricity using renewable energy sources. This is observable in the countries with a negative difference in the percentage of renewable energy needed to generate electricity. Ethiopia and DR Congo, which are listed as using close to 100% renewable energy, owe that accomplishment to hydroelectricity. Similarly, 67% of Norway’s energy comes from hydroelectricity. The other countries in Table 2 use hydroelectricity for approximately 30% of what they need for their electricity production. While an extremely important renewable source, hydroelectric facilities produce variable units of electric power, depending on changes in climate and weather. This entry was posted in Anthropocene, Anthropogenic, Climate Change, Sustainability and tagged Adaptation, Anthropocene, Anthropogenic, Bangladesh, Brazil, burn out, China, Clean Energy, climate, Climate Change, Climate Change Denial, Climate Change Deniers, Climate Skeptics, CO2 emissions, Congo, Denmark, Dieter Helm, Economics, electric car, Electricity, electricity access, electricity consumption, Emissions, Energy, energy transition, Environment, Ethiopia, Finland, Fossil Fuels, Future, GDP, GDP per capita, GDP/capita, Global Population, Global Warming, greenhouse gas, Hydroelectric, India, Indonesia, Mexico, Mitigation, New Zealand, Nigeria, Norway, OECD, Pakistan, Population, Power, power consumption, Power Plants, purchasing power parity, Renewable, Russia, Science, Solar Energy, Sustainability, Sweden, Technology, US, Weather, Wind, World Bank, World Population. Bookmark the permalink. Thank you for your letter of self forgiveness.